Hi! 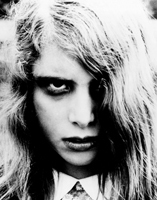 My name is Kyra Schon (see handy pronunciation guide here) and I appeared as the cellar dwelling, trowel wielding, mother stabbing, father's arm eating zombie girl Karen Cooper in the original 1968 Night of the Living Dead. I grew up watching and loving horror movies and I realize how fortunate I was to be a part of horror-film history; it has truly been one of the highlights of my life. Quiet groan of tearing flesh. To pierce your heart like a rose. And gather along rock walls. Your white dress lies still. Darkened by your dying love. © Kyra M. Schon. All rights reserved.Reproduction of any content, images or sounds, in whole or in part,without express written permission, is prohibited.All Zombie Zen Haiku are the property of their respective authors.Violators will be prosecuted and eaten.